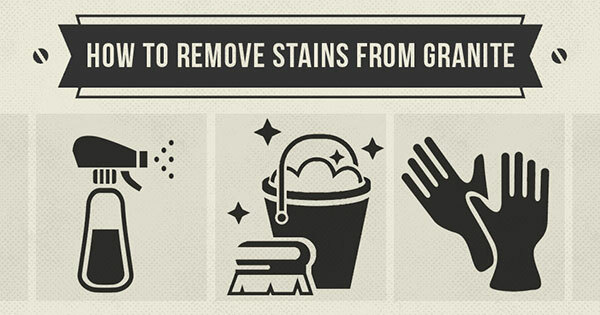 If you find that the stains don't come out with your initial efforts to remove them, don't panic, you've got to know how to remove them. If the foreign substance remains on the granite for more than 20 or 30 minutes, you're likely to wind up with a stain. Lucky for you, the experts have advice to help people like you remove all types of stains from their granite countertops. The easiest way to remove stains from your granite countertops is to avoid them in the first place. Always use a coaster for your glasses and cups, wipe up any spills immediately and make sure to seal your countertops on a regular basis. Those stains caused by spilled coffee, wine, fruit juices or even water can be lifted with hydrogen peroxide, which is available at any grocery store, and a clean cloth. The hydrogen peroxide will work its way into your countertops and remove the stain. Those slick, shiny stains caused by cooking oils, milk and most synthetic products can be cured by using a poultice compound, which is available at hardware stores. The compound will work its way into your countertops and remove the substance that is causing the stain. Contact the experts at JSC Stone. They have experience dealing with granite countertops that can help you.